The book provides an insight into the advantages and limitations of the use of fractals in biomedical data. It begins with a brief introduction to the concept of fractals and other associated measures and describes applications for biomedical signals and images. Properties of biological data in relations to fractals and entropy, and the association with health and ageing are also covered. The book provides a detailed description of new techniques on physiological signals and images based on the fractal and chaos theory. 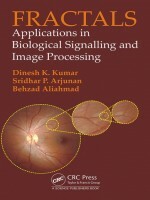 The aim of this book is to serve as a comprehensive guide for researchers and readers interested in biomedical signal and image processing and feature extraction for disease risk analyses and rehabilitation applications. While it provides the mathematical rigor for those readers interested in such details, it also describes the topic intuitively such that it is suitable for audience who are interested in applying the methods to healthcare and clinical applications. The book is the outcome of years of research by the authors and is comprehensive and includes other reported outcomes.